Weddings are synonymous with planning. Just as a bride should book a venue months in advance and schedule consultations for her hair and makeup, so should she plan out what she will wear on her nails. That translates into more planning on your end. Here are some ideas for keeping you and your clients on track. While your loyal clients will probably already come to you for any nail needs, you can still get your name out there to attract more brides if that’s something you want to specialize in. Attracting out of town brides is ideal if your salon is in a popular destination wedding spot. > Popular wedding publications, blogs, and sites are great venues for advertising. 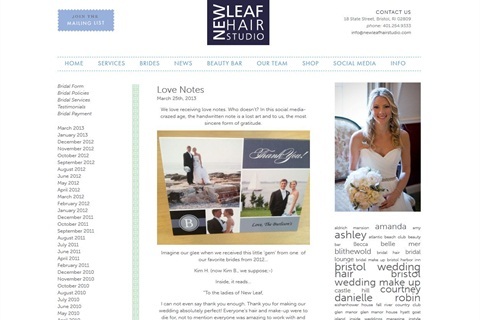 Nicole Cabral of A New Leaf Hair Studio in Bristol, R.I., dedicates a special blog to all the weddings the salon has done and advertises it on The Knot. > If you work in a salon that offers hair and makeup in addition to nails, make sure your coworkers are promoting your services too. “It is very easy for them to ask if they have made plans for their nails and bring them to me for a consult if they don’t have any plans yet. Many brides think automatically of hair and makeup, forgetting that people are going to be taking pictures of their hands,” says Cordes. > Make sure there is a special tab on your website marked “For the Bride” or “Wedding Packages” to highlight these services. > Additional services such as airbrush tanning, makeup, skin care, massage, and conditioning treatments are all offered to the bride and her party at Bodicare Nails & Spa in Sewell, N.J. Offering many services in one location makes planning easier for the whole party. Weddings can be very costly, so make sure you have a package ready to show your brides in order for them to budget accordingly. If you are offering specials or promotions make sure to market them effectively so clients can get the most out of these deals. > A consultation will save time and money. Include the cost of the consult in the pricing. By taking 15 minutes to have a sit down with the bride before her wedding day you will have time to prepare a design and get a feeling for what she wants. That way on the wedding day you will be able to do her nails quickly. > Consider creative ways to sell both the bride and her party. Cordes once ran a deal that would allow the bride to get her nails done for free if five members of the wedding party signed on. > Nail tech Sam Rivenbark of East Coast Acrylic in Edenton, N.C., sets up her menu of acrylics, gels, and pedicures, but then offers free nail art to her brides. Whether your client wants her nails done before leaving town or your client is in town specifically for her wedding, here are some ideas on making your salon a definite destination. > “Gel-polish just holds up better in the sand than regular polish,” says Cordes. So if your client is planning a destination wedding or honeymoon on the beach, remember to recommend these products. If a bride has never worn gel-polish, warm her up to the idea by applying some at the consultation so she can test it out. > Cordes often has to deal with members of the wedding party from out of town. She encourages her brides to tell these members not to have their nails done before flying out. Then she makes sure to book enough time to take care of whatever they may need. Setting your clients up on a nail program ensures that their nails will be in shape and able to support whatever kind of service they decide to apply for the big day. > Cordes recommends doing a gel-polish manicure about four days before the wedding. > If a bride is trying to grow her nails out, Cordes suggests manicures every two weeks for as much as three months prior to the date. > For a set of acrylic nails, Cordes says she would do the full set two weeks before the wedding. > Avy Tran of Bodicare Nails & Spa tells her brides to massage cuticle oil into their nails every day. > Once a bride has booked her appointment with New Leaf Hair Studio, she schedules a couple of trials. “We usually always get it right at the first trial, which we schedule two months before the actual wedding. The actual wedding nails are usually done two or three days before the wedding, so brides can have beautiful nails for their rehearsal dinner or any other special event they may have leading up to their big day,” says Cabral. > Rivenbark finds that most of her brides only want enhancements on their special day. She says it’s after the honeymoon when enhancements have been safely removed that she begins the bride on a natural nail care program. Here are some things to keep in mind if you offer wedding services or are considering doing so. > Always book extra time. > Encourage brides to buy the same bottle of polish you are using on her nails or gift her the bottle. This comes in handy for slight touch-ups, comparing her color to others in the wedding party, and makes for a sweet keepsake. > “Brides can change their minds 10 times before settling on a nail style. Be patient, it’s their big day and they are probably freaking out about a million other things. Make sure your work reflects your brand regardless of what the bride says. If you do not feel comfortable doing something, tell the bride well in advance. Simple nails need to be executed well so do not think that you can be lax with your work,” cautions Tran. > “Remember that bridal nails are a lot like stage makeup. For a French, you want to be a little more extreme with whatever you are doing, so it looks right in front of a larger audience and in pictures,” suggests Cordes. > Cordes also likes to remind her brides to let the wedding party help her out so that her nails are treated like jewels and not like tools. > Nails should enhance the ring and the overall look, not detract from it. > If a bride is trying to match her nails to her attire, Cabral recommends bringing in shoes or a swatch of the dress. Offering services for the groom and his guys is also a good idea. Remember, men will have their nails in the pictures too. > “Manicures and pedicures for the groom make a very happy bride,” notes Rivenbark. > Cordes makes sure to do a clear acrylic nail biter overlay if a man’s nails are in particularly bad shape. > Tran recommends a sports pedicure with callus treatment, hand scrub, and manicure to her grooms. Important dates to remember for your bride and begin scheduling around.